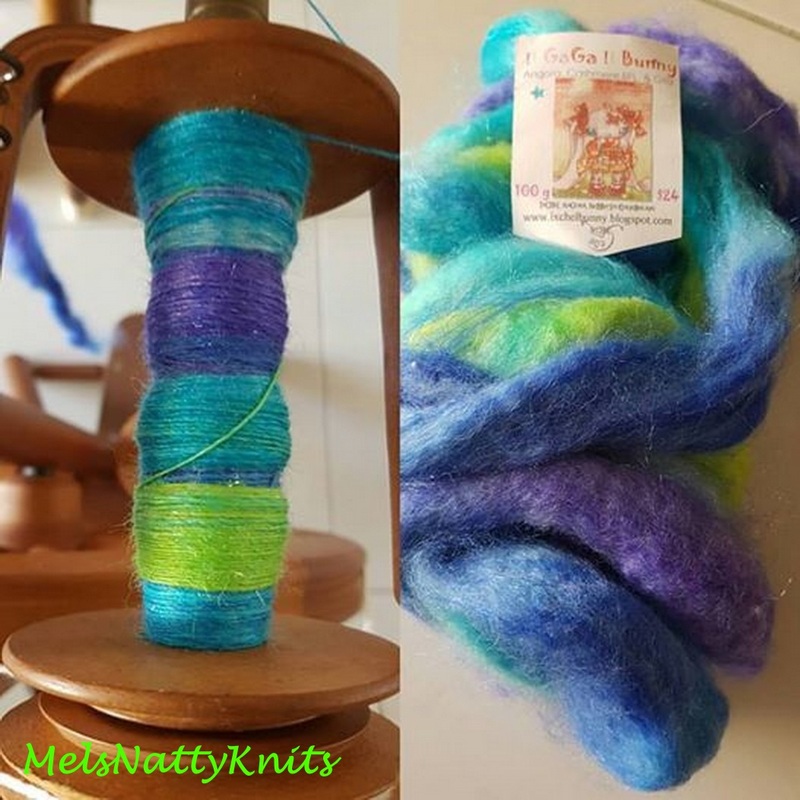 You’ve probably noticed that I haven’t been blogging about any knitted garments recently and that’s because I’ve been quite busy spinning. 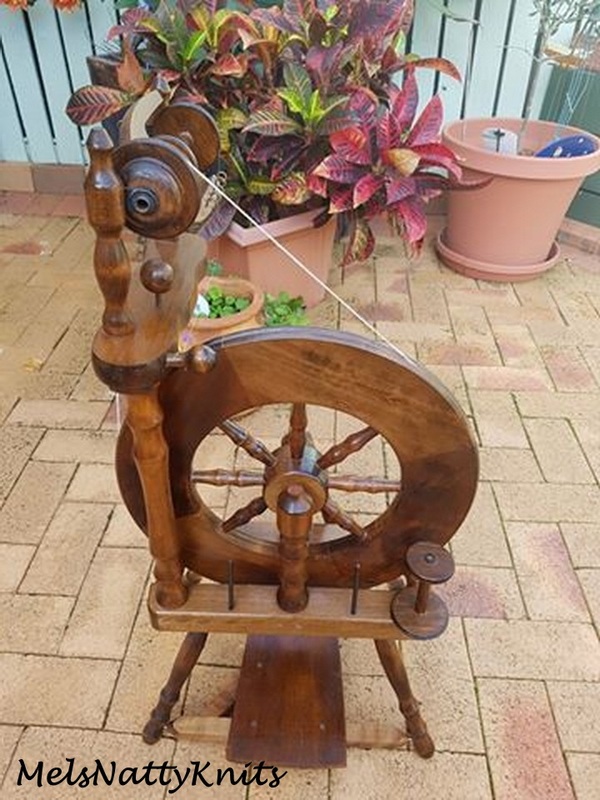 Yes, I’m in the spinning mood and have four wheels on the go with different spinning projects. 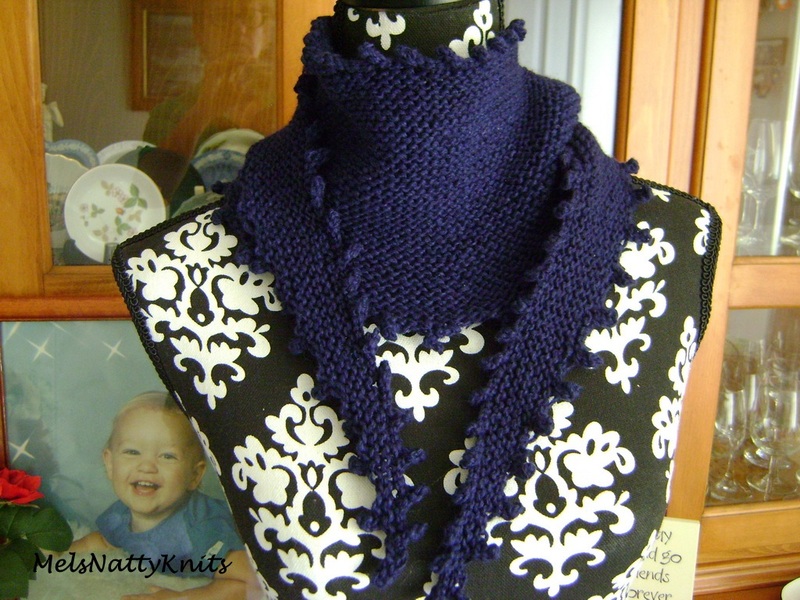 Plus, of course, I do have a number of knitting projects on the go too! 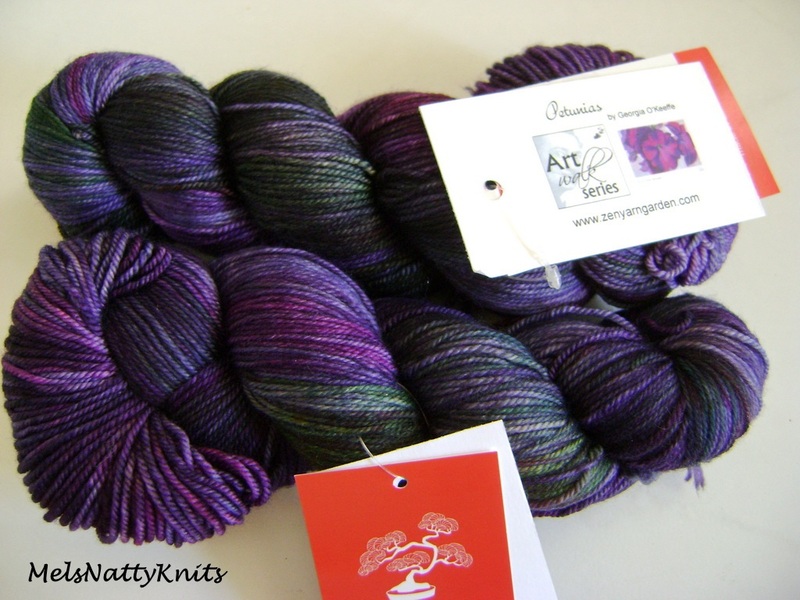 I’ve recently finished this Ixchel Bunny Fibres‘ blend called Don’t You Want Me Baby. 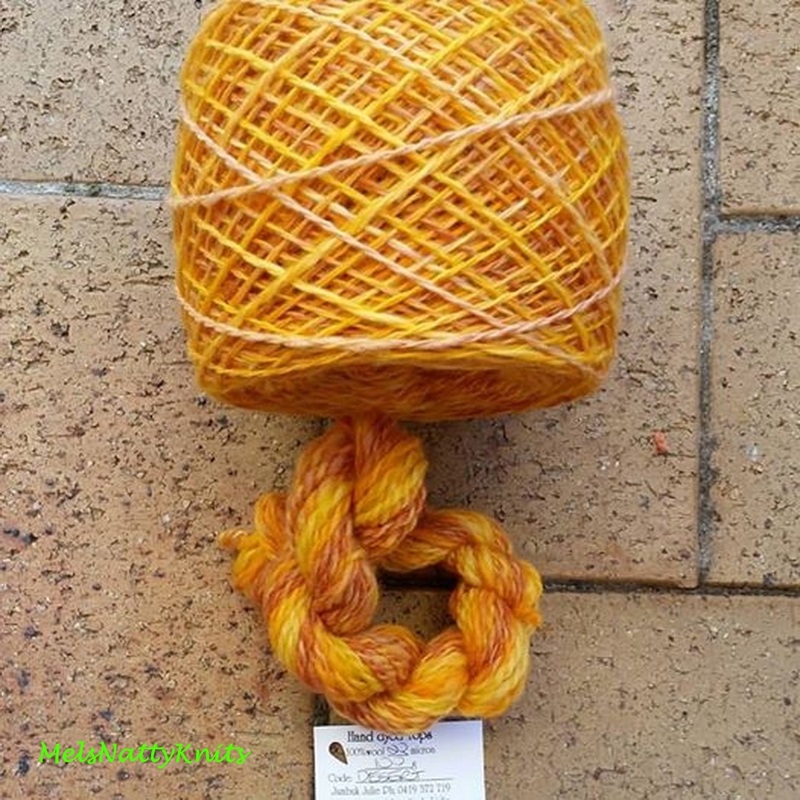 It’s plied with a beautiful gold metallic thread and I’ve made a gorgeous shawl with this yarn which I’ll show you very soon. 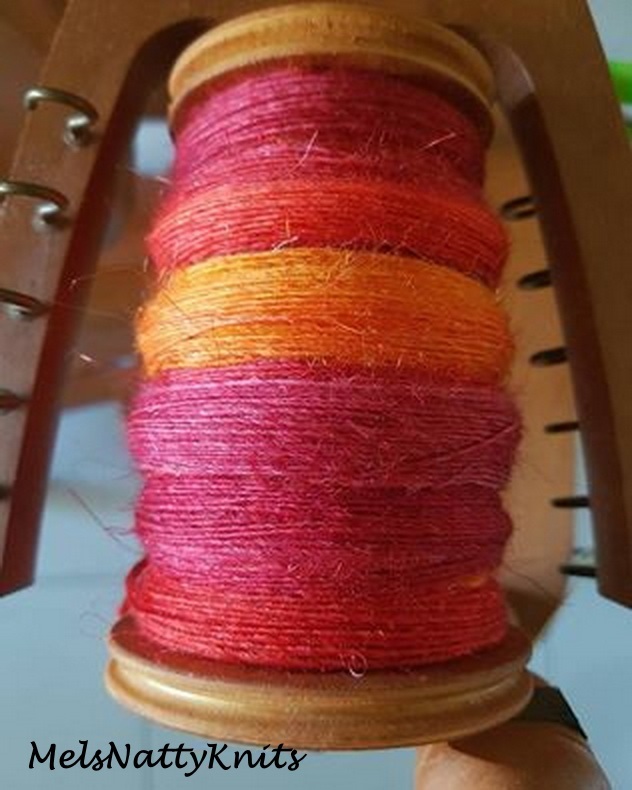 This stunning Ixchel Bunny Fibres’ blend called Peacock in a Pear Tree is currently on my Sickinger wheel. 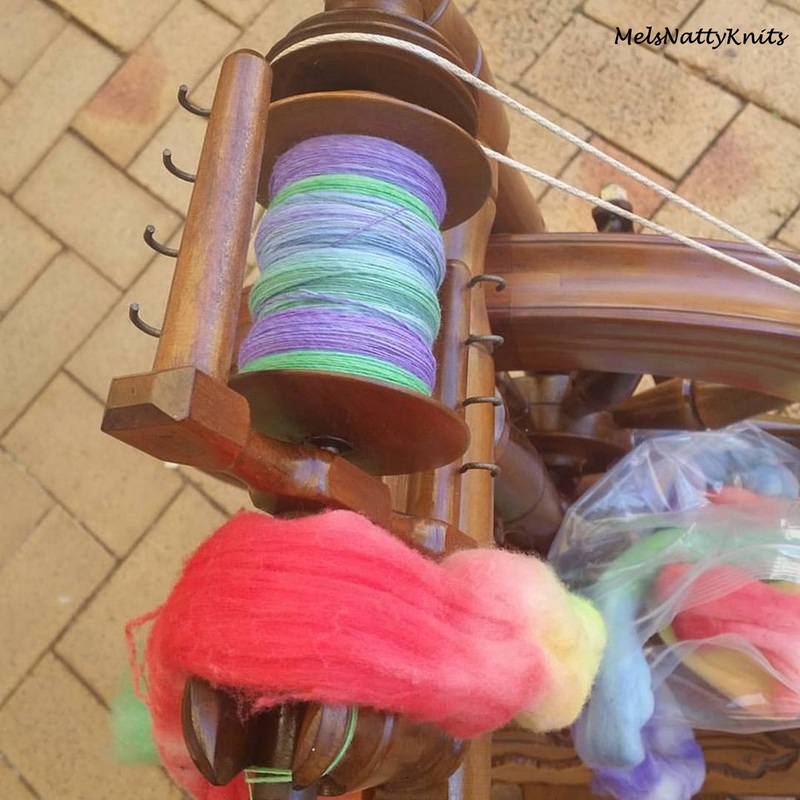 I love the glitz that Charly adds to her blends as they make each spinning project ‘pop’. I recently sold this Black Bunny Tops from Ixchel Bunny Fibres to a friend who is going to use it in a weaving project. 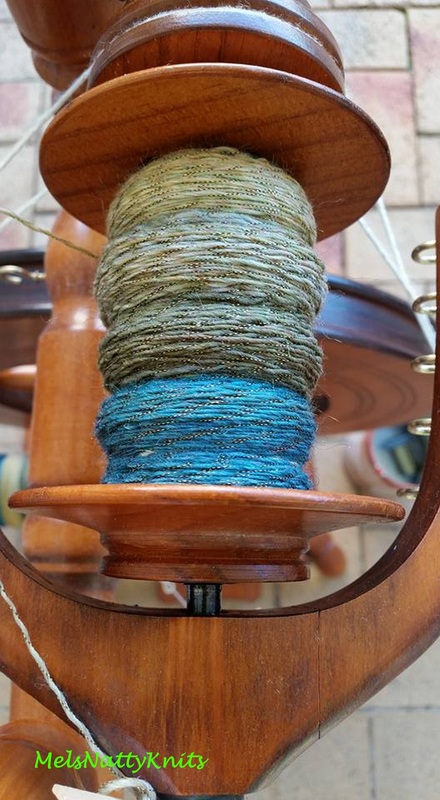 It’s plied with a grey thread. 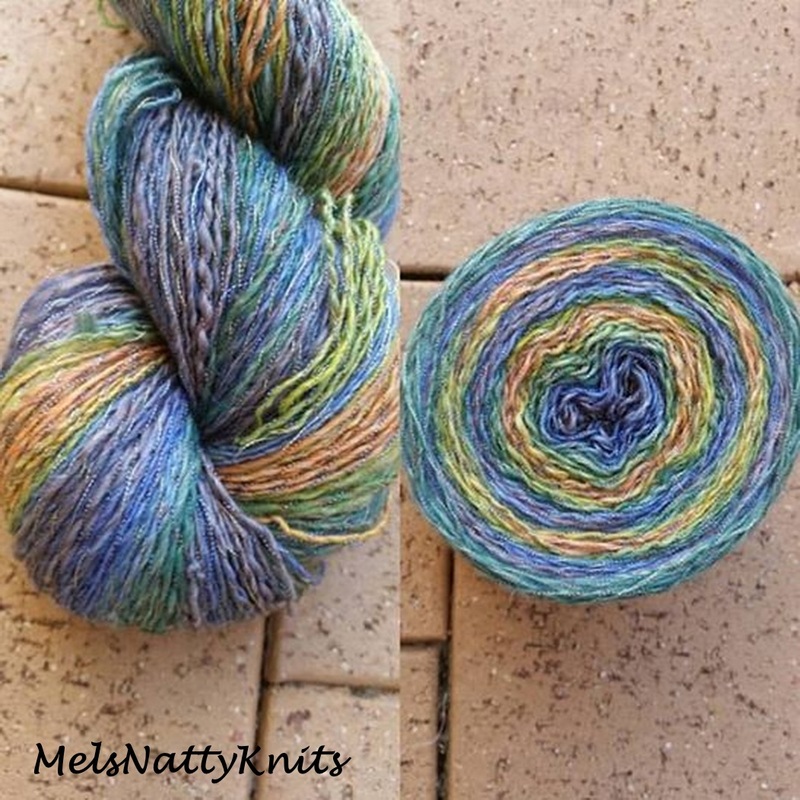 This is 100% merino in the colourway Desert. 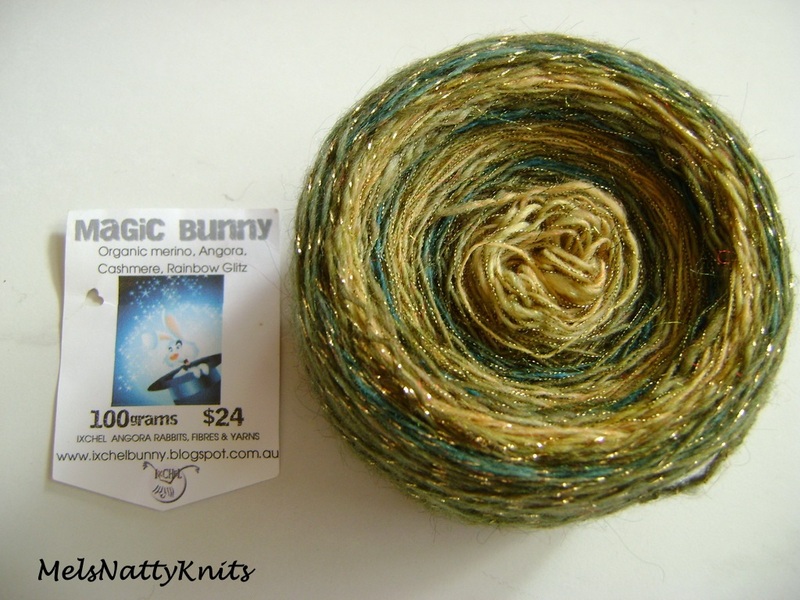 I absolutely love this Ixchel Bunny Fibres‘ Magic Bunny blend! 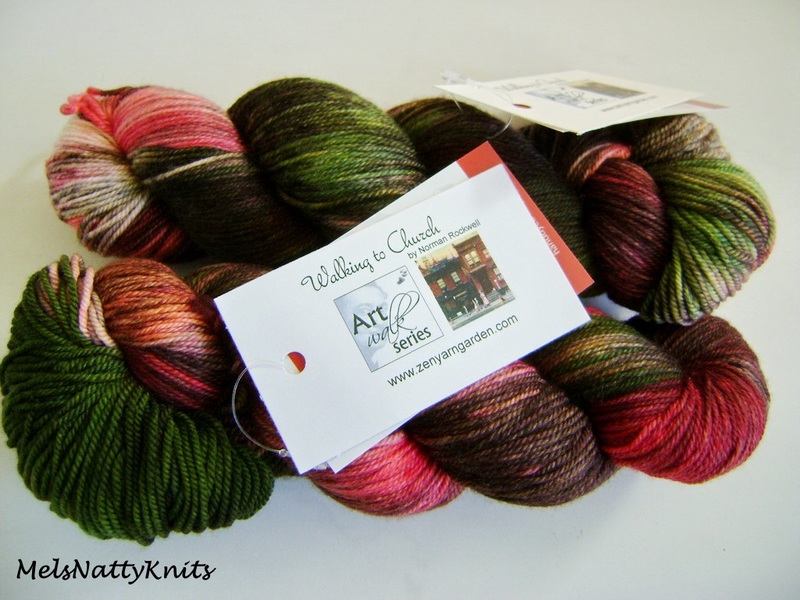 I’m knitting a shawl with this beautiful rainbow blend. 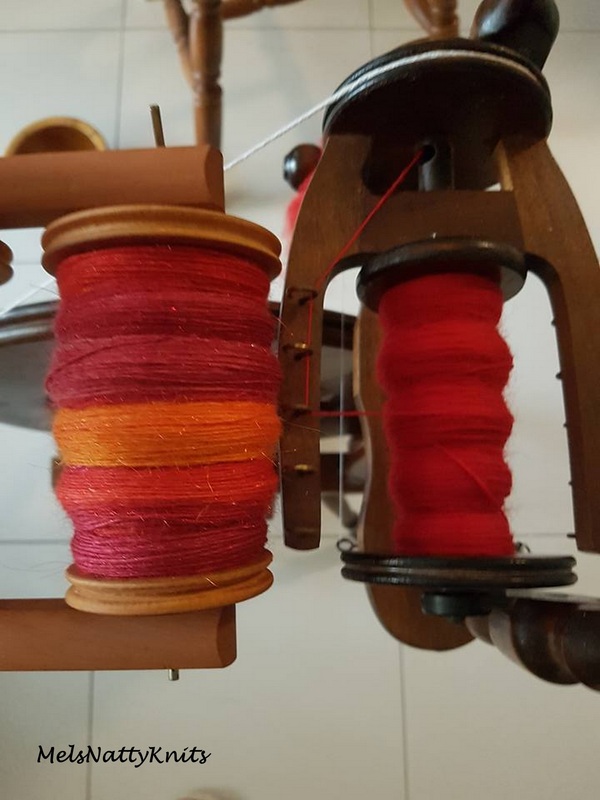 I’ve had to take a few photos so you can see all the lovely colours. 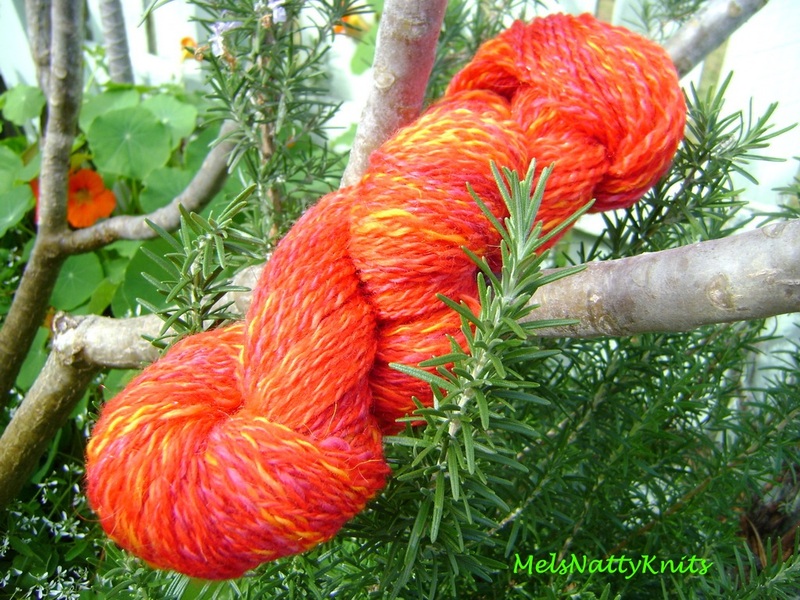 This next colourway is not usually one I would select, however, the red and orange were so vibrant I couldn’t resist. 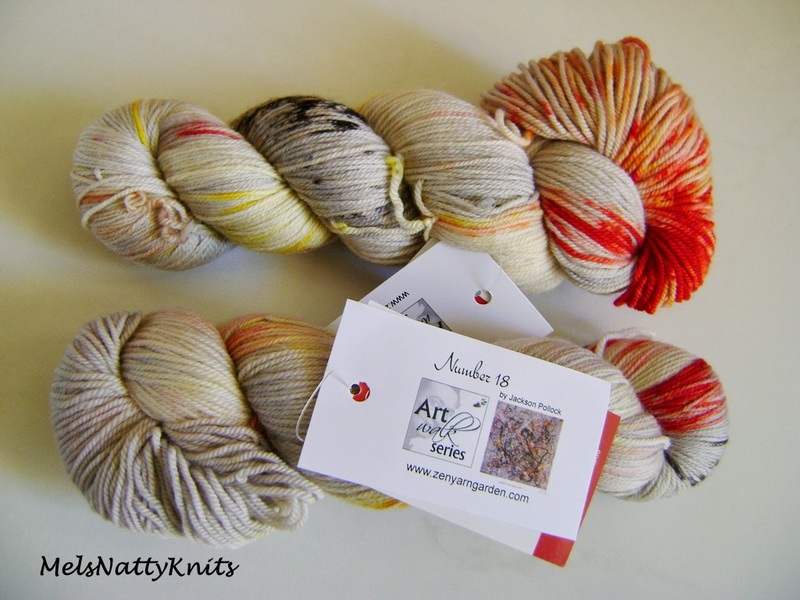 It’s another Ixchel Bunny Fibres‘ blend called Sunset on Mars. 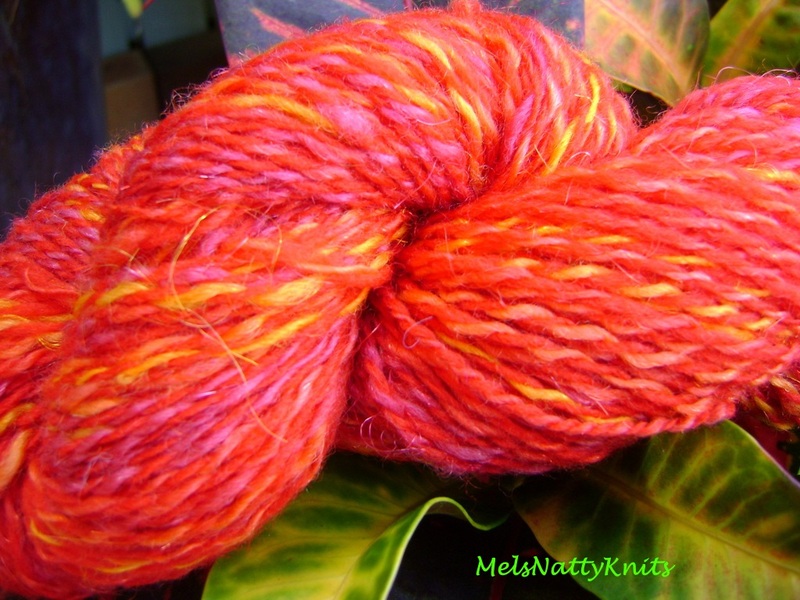 I had a sliver of red merino so I spun it and plied it with the Sunset on Mars and it looks a treat! 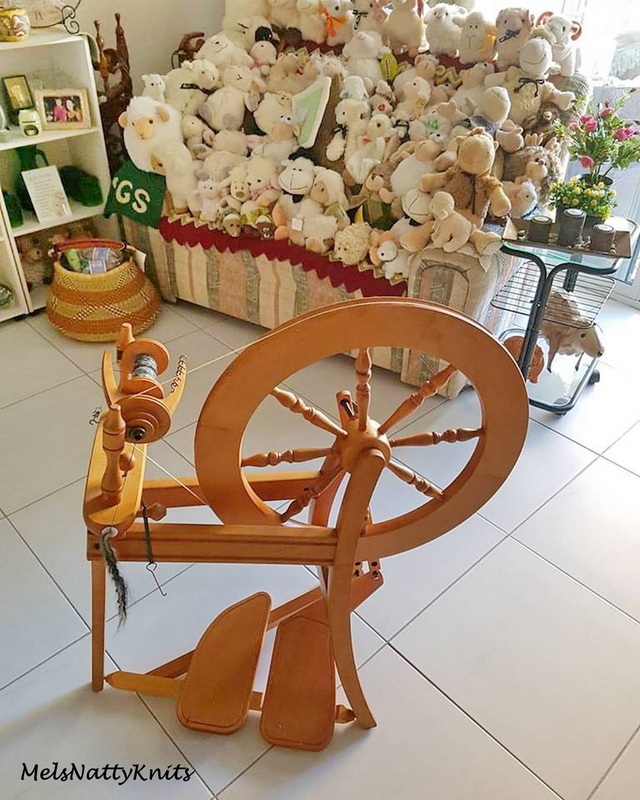 The other spinning wheel I picked up is a Sleeping Beauty Thumbelina but I need to get a part made before it is functional. Well that’s all my news for now! 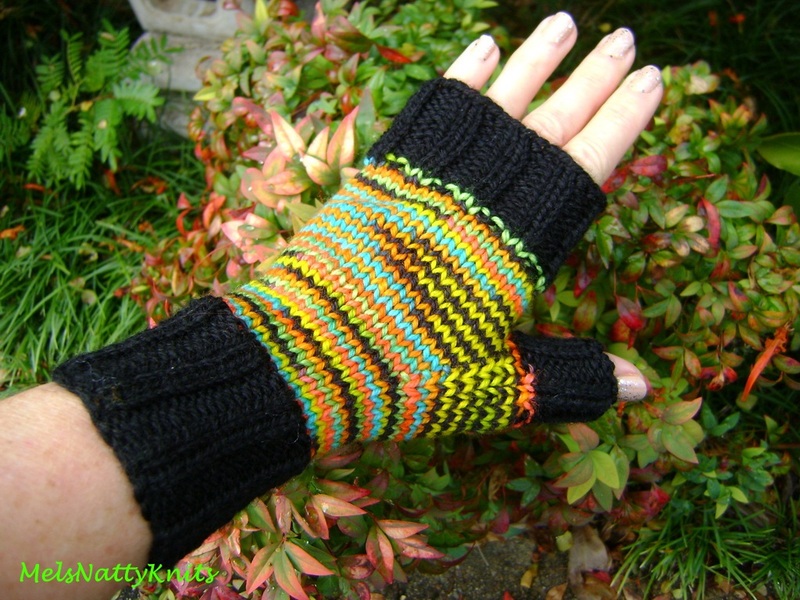 A Frenzy of Fingerless Mitts! I’ve been on a roll lately knitting lots and lots of fingerless mitts. 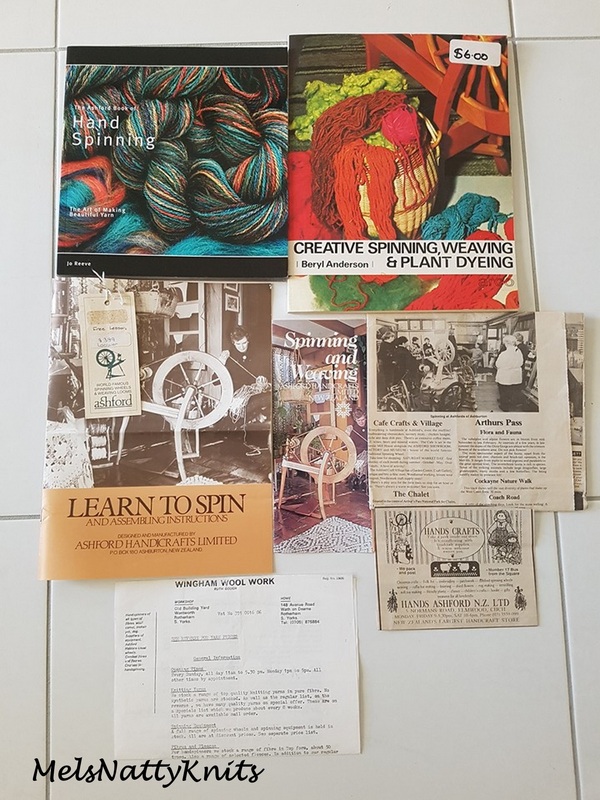 Over the years, I’ve been collecting different patterns with a view to eventually getting to knit all sorts of garments. 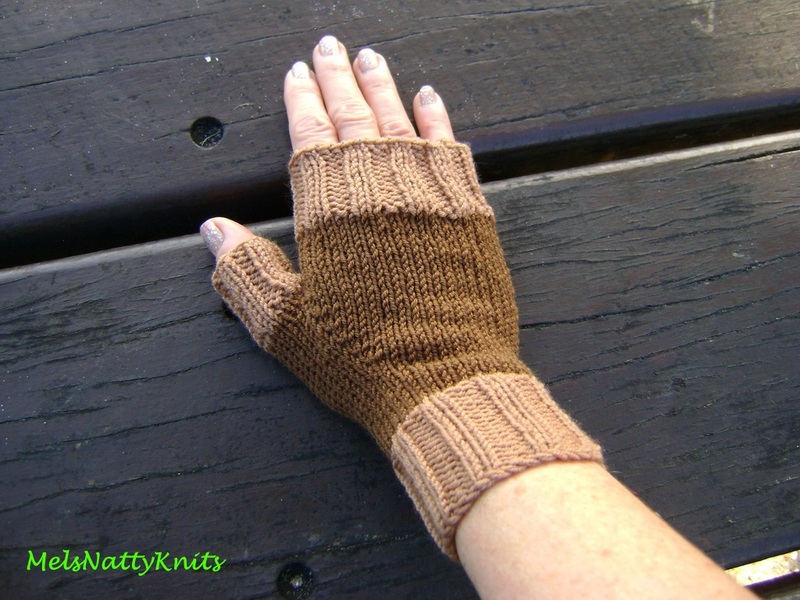 Fingerless mitts is the latest craze. I found this really easy pattern to start off with: Good Times Fingerless Mitts and have proceeded to knit quite a few pairs! 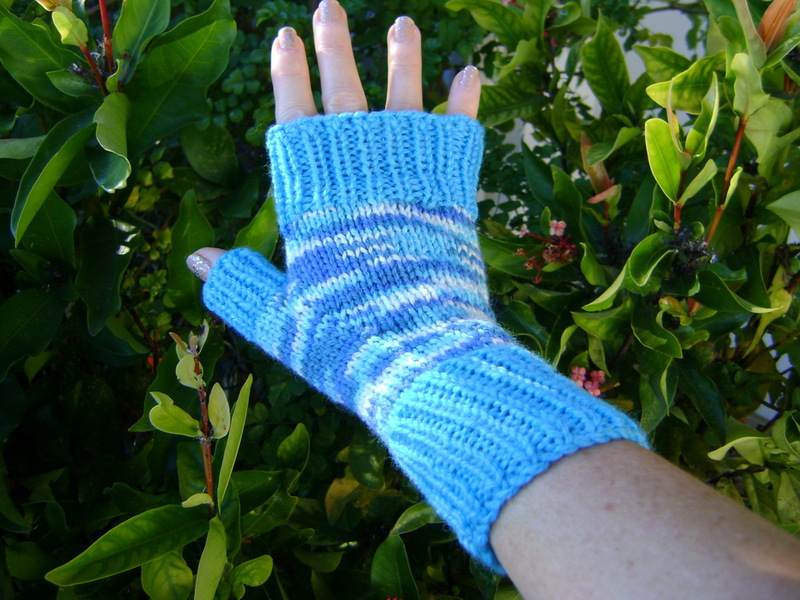 Shepherd Colour 4 Me 8ply and Shepherd Colour 4 Me Prints 8ply were used in these aqua blue mitts. 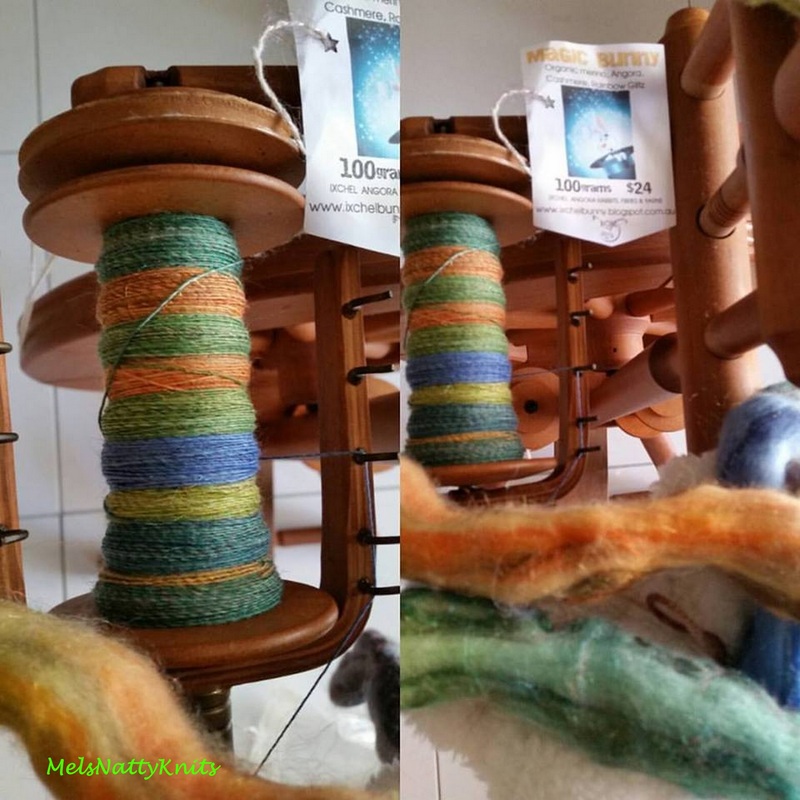 The edging of these mitts was knitted in Fiberific Sombrero 8ply and the main part was knitted in my handspun 100% merino in the colourway Outback. 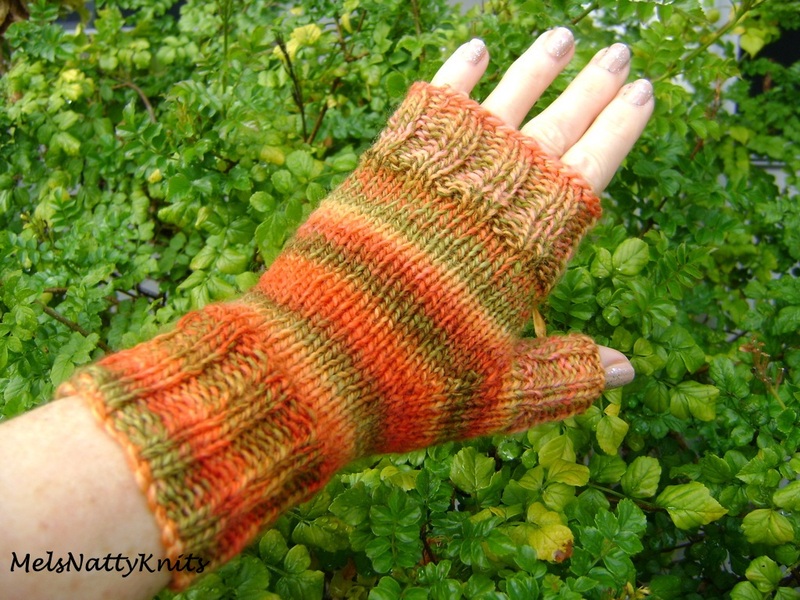 The edging in these mitts was knitted in Moda Vera Pure Wool 8ply and the main part in my handspun. 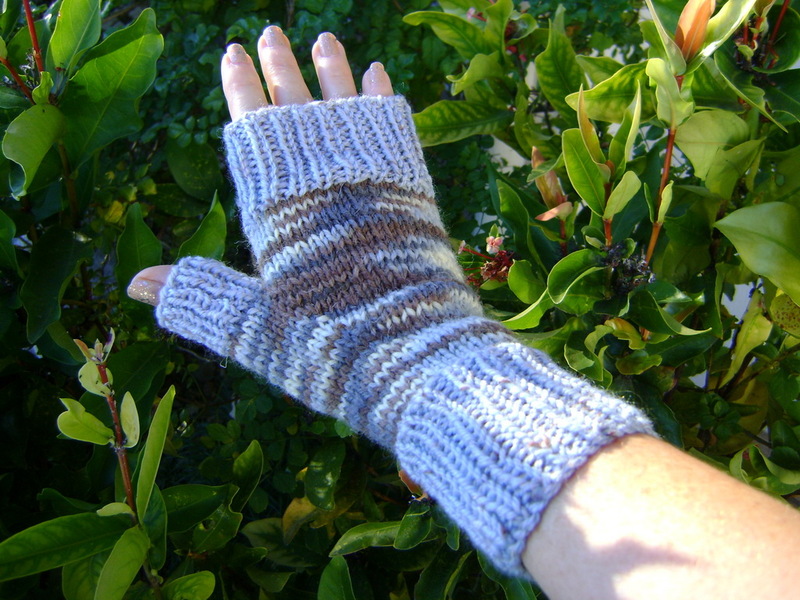 These mitts are knitted entirely using my own handspun. 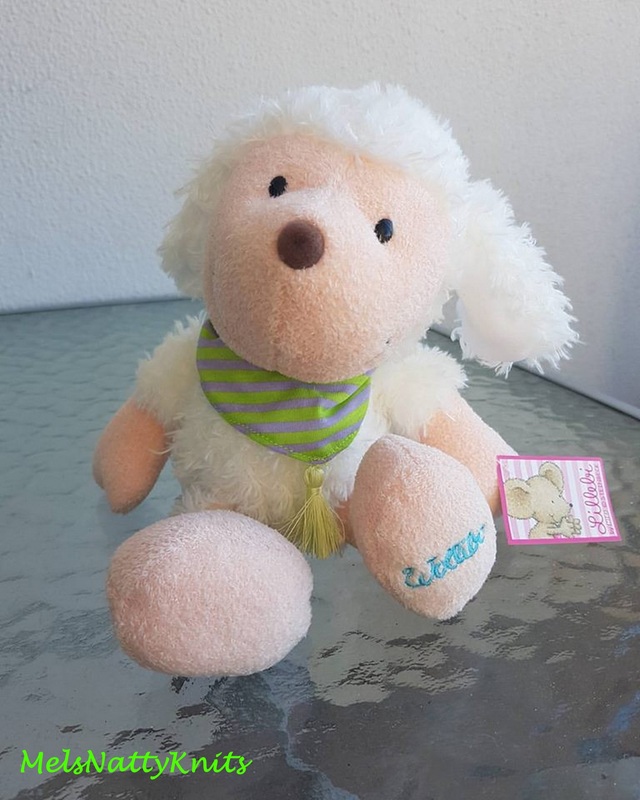 They are soooo soft! 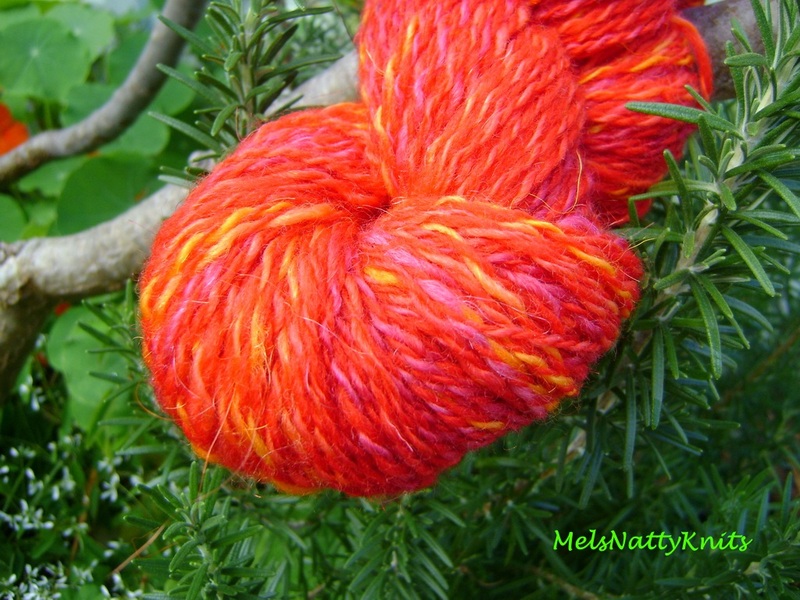 I used Lotus Winter Sun to make these mitts. 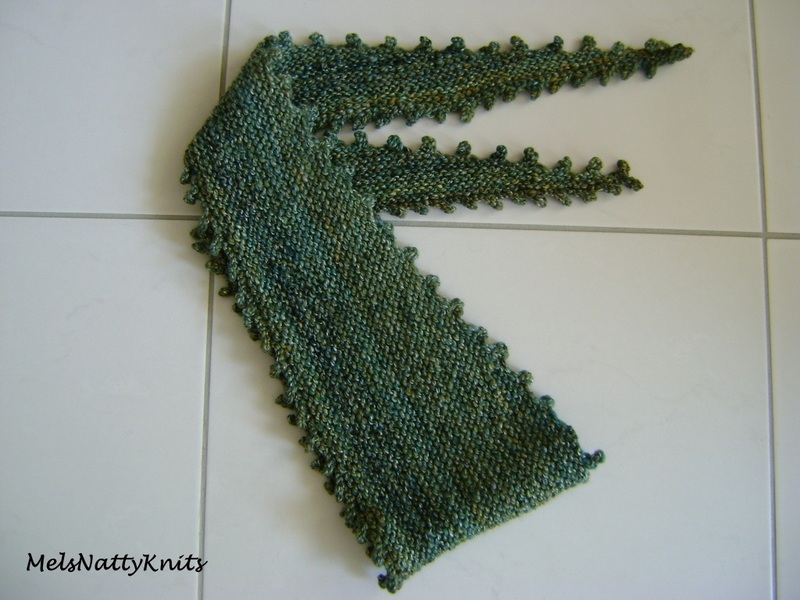 For the ribbed edging I used Cleckheaton Country Naturals 8ply and for the main part I used Lincraft Cosy Wool. 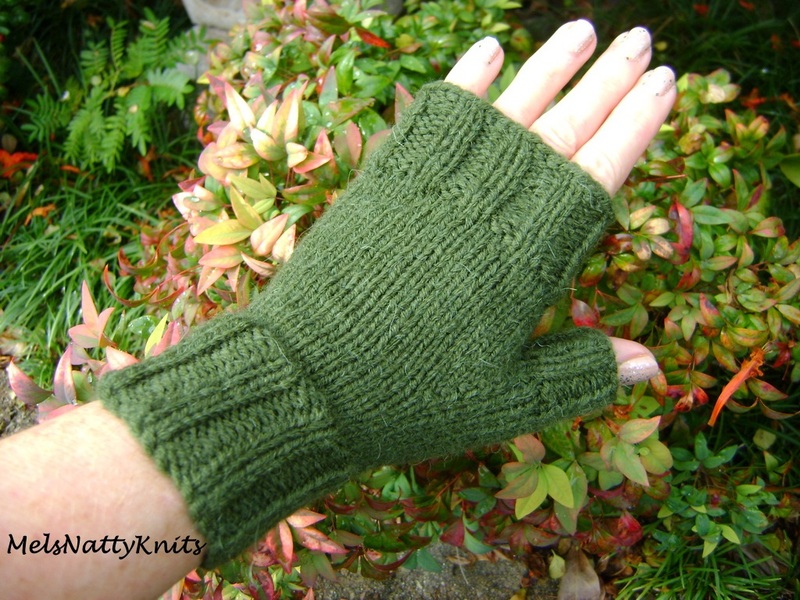 These are the very first mitts I made using Sullivans Aztec which has an alpaca component making them really soft. And that’s just the start. 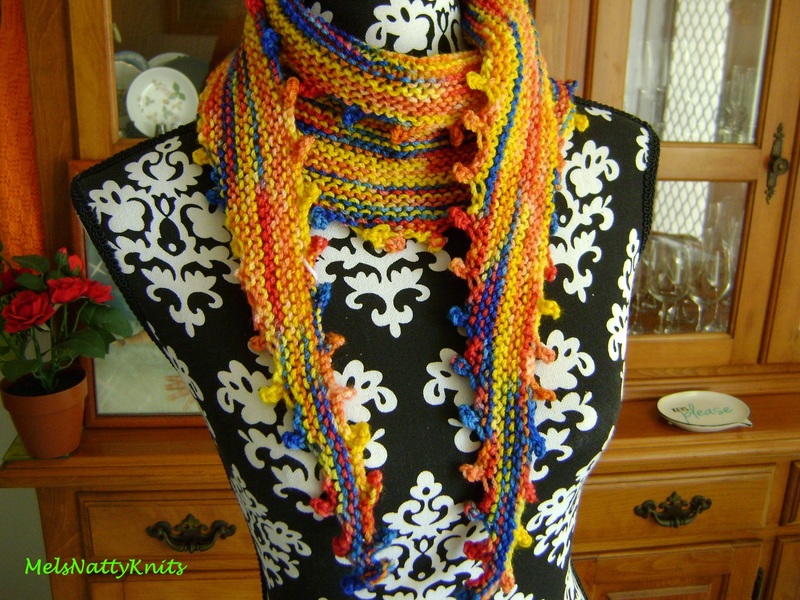 I’ve made lots more using different patterns which I’ll show you at a later date. So if you haven’t made fingerless mitts previously and you’ve been toying with the idea, I would highly recommend that you start! 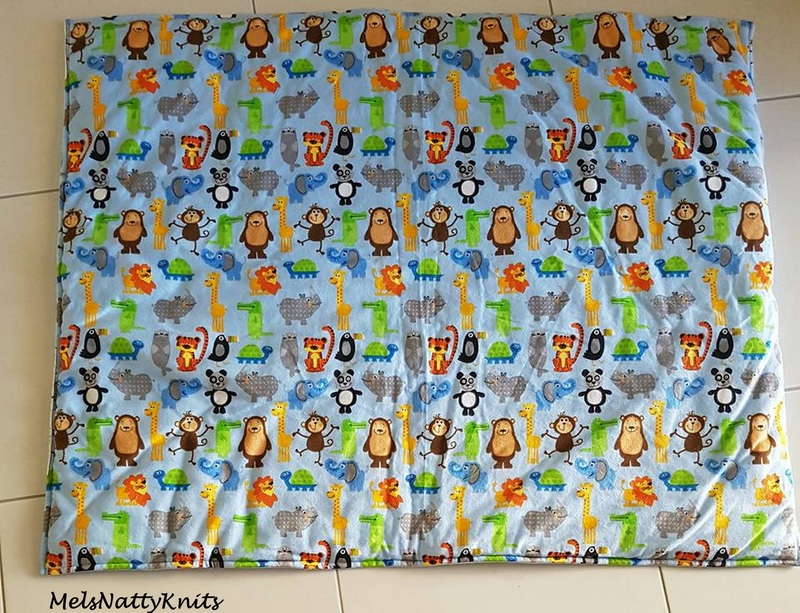 The thumb area is not complicated so long as you follow the very easy instructions in the pattern. 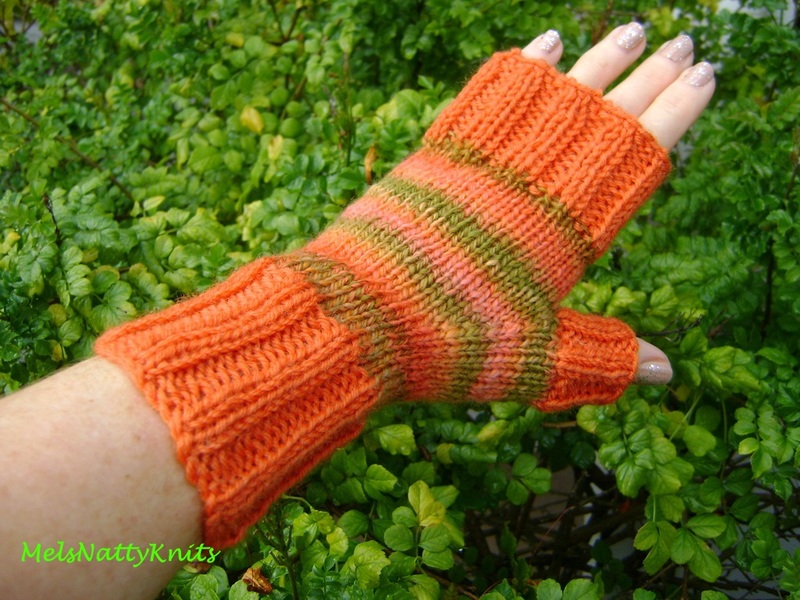 I had so much fun mixing and matching yarns for the ribbed edging and the main part of the mitts to give a different look. 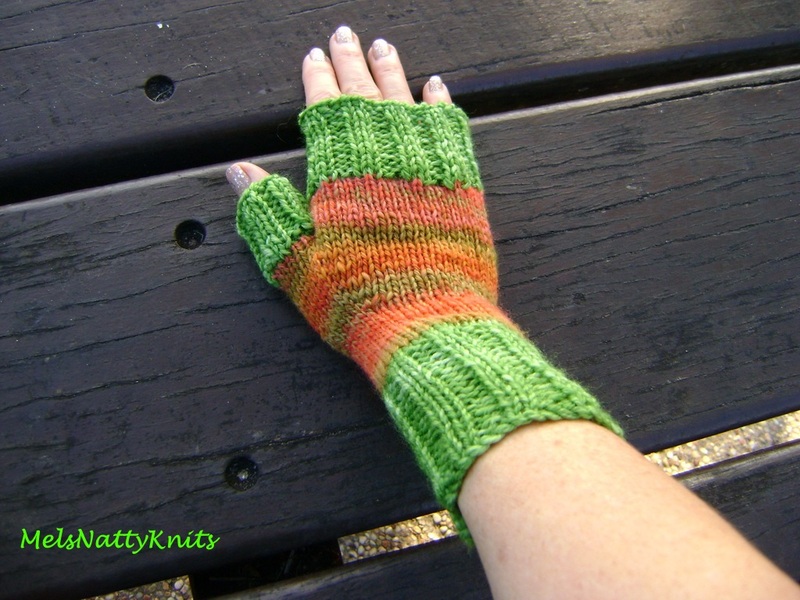 If you’re interested, I have some mitts for sale on my MelsNattyKnits FB page. 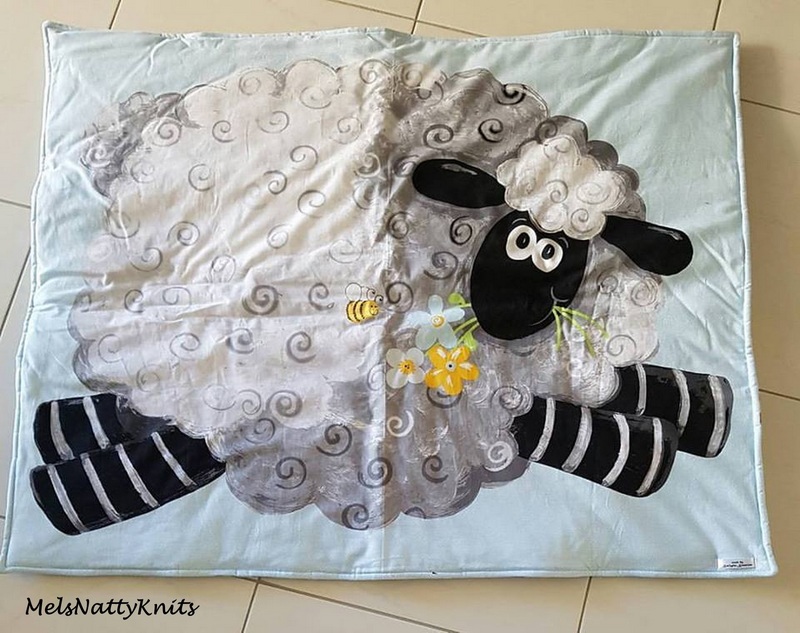 This particular scarf was made from my own handspun fibre which is an Ashford merino/silk sliver in the colourway Peppercorns. It’s lovely and lush and springy. 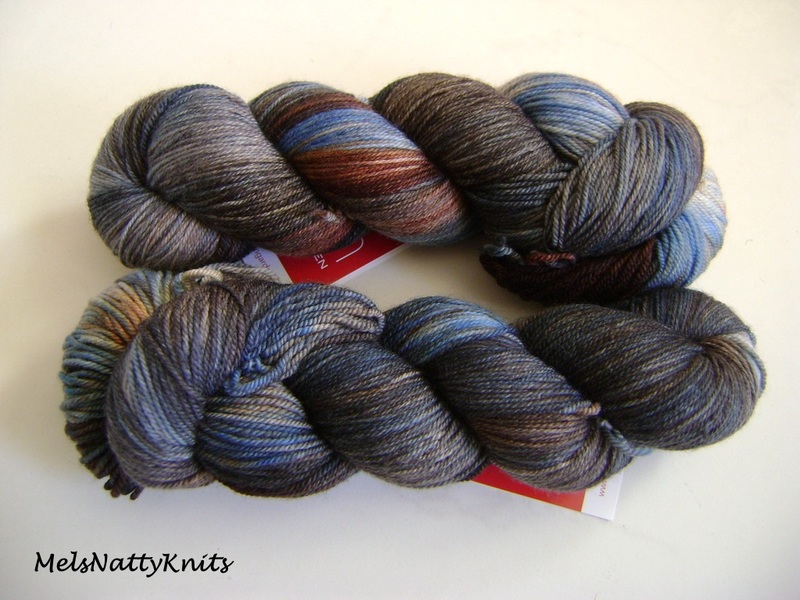 Good old Cleckheaton Country Colour 8ply; you can’t go wrong with this wool and particularly this gorgeous colourway. 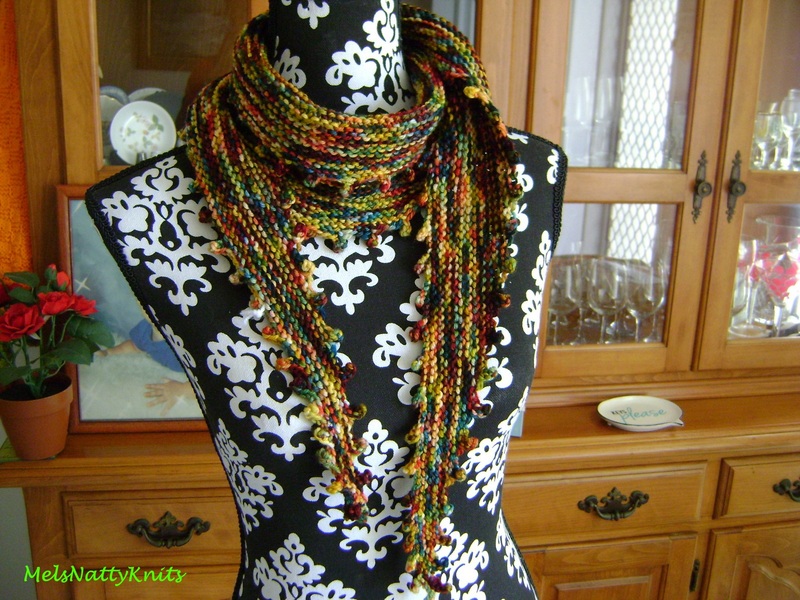 Depending on how wide you make your scarf, you can easily wear it this way. 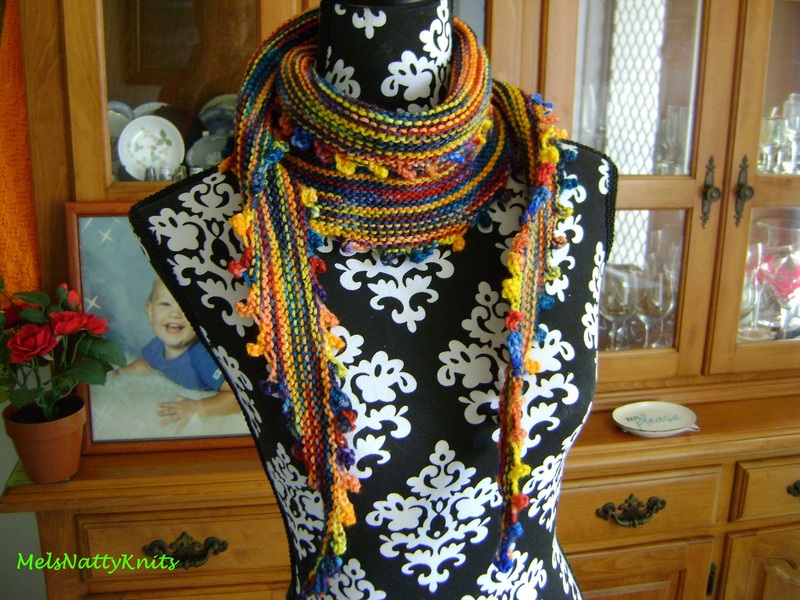 Moda Vera Bardini was used to make this scarf. 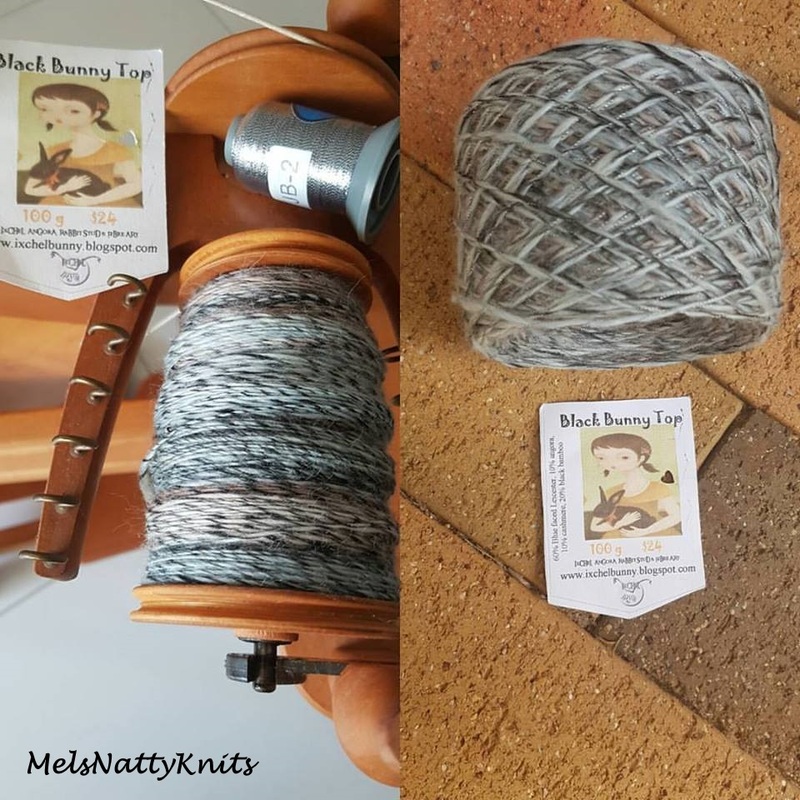 I know the colour is a little boring but the number of times I’ve wanted just a plain navy scarf was happening much too often so when I saw this yarn on sale I grabbed it! 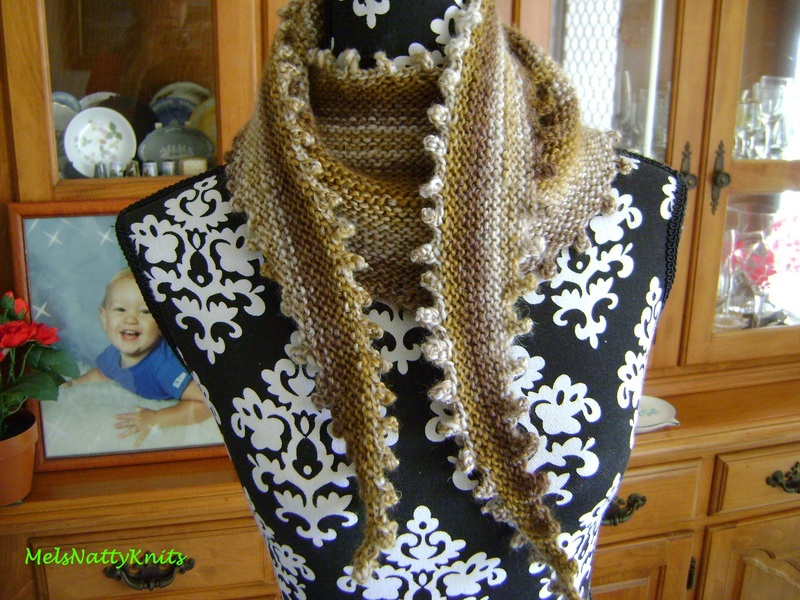 Passioknit Outback Langley is the yarn used in this scarf and the colourway is Old Gold. 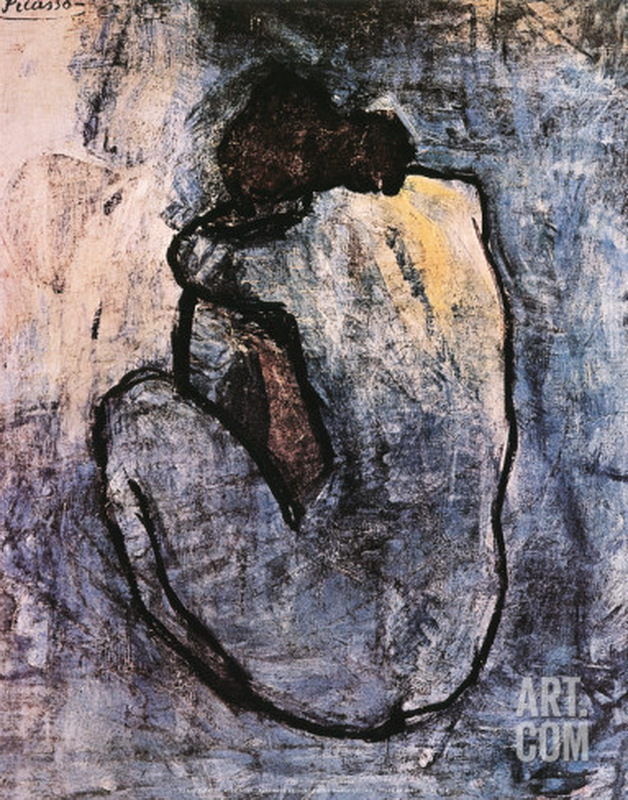 I’m rather fond of these colours. 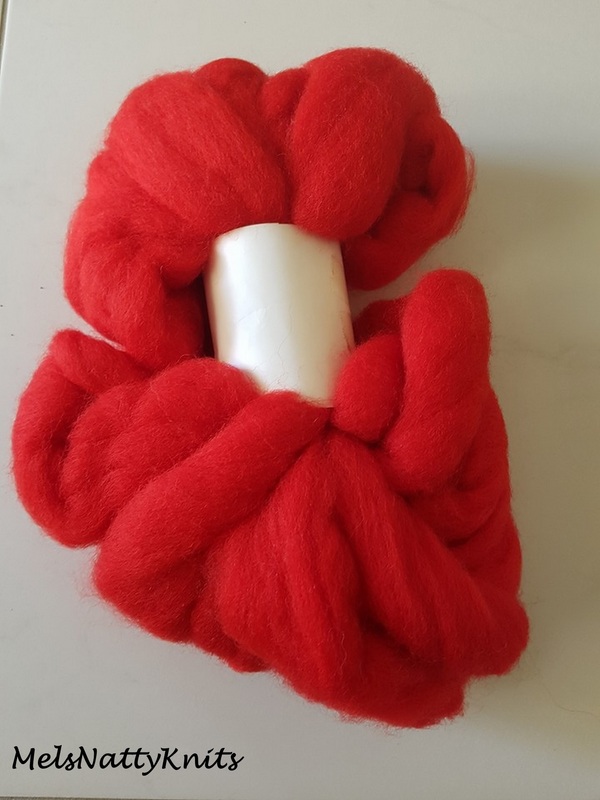 I bought two balls of hand-dyed Bendigo Woollen Mills Classic 8ply from the Queensland Spinners Open Day in May this year and made two of these scarves. This one is slightly lighter and brighter. I’m loving all these colours together. 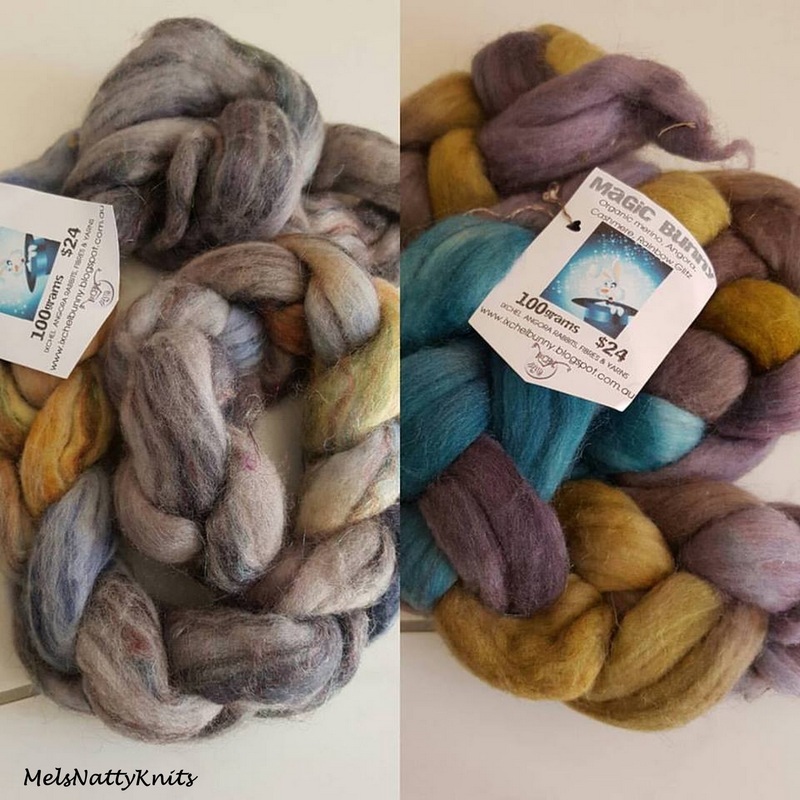 The following two scarves are in hand-dyed Bendigo Woollen Mills Luxury 8ply, again from the Queensland Spinners Open Day. 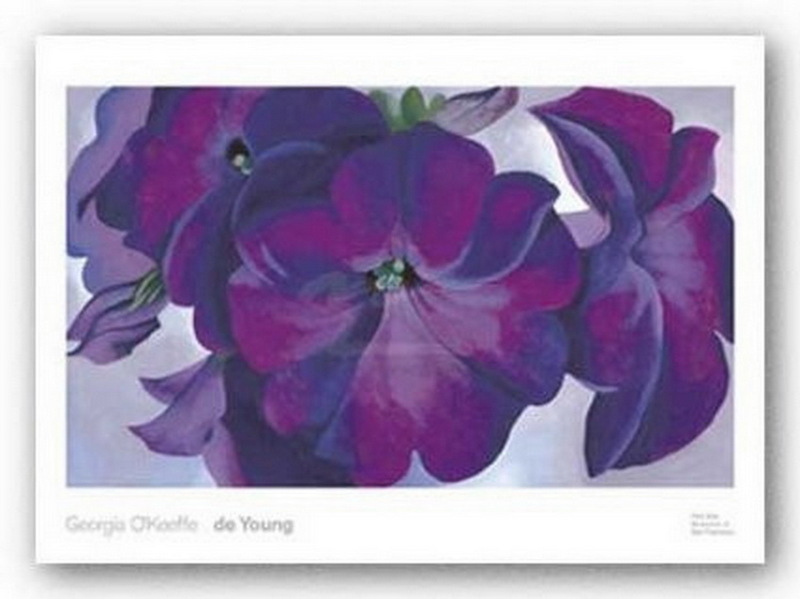 I sold this one at our Open Day (along with quite a few other items). 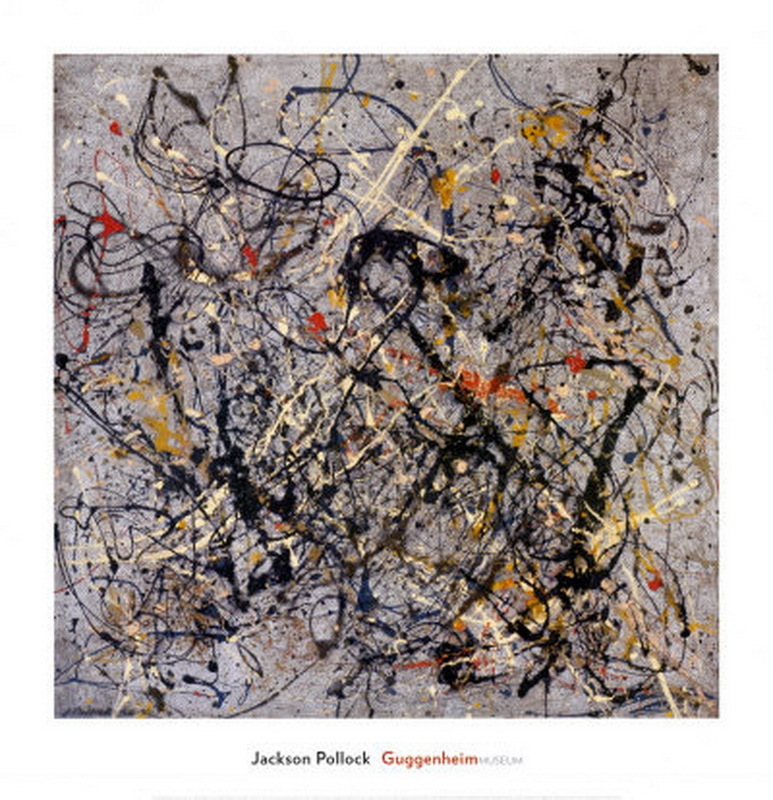 This one is slightly lighter and I love it! 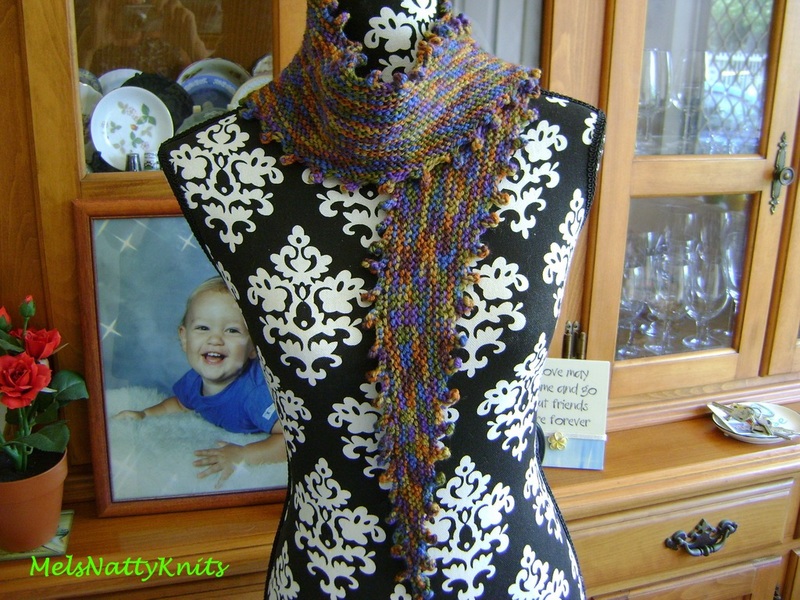 This pattern is fabulous if you just have a couple of balls of wool left. 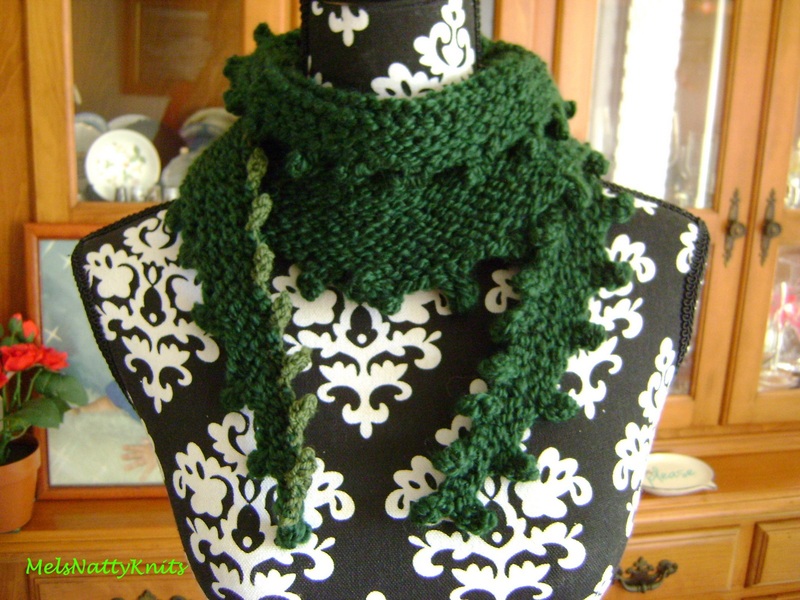 The overall width of your scarf is determined by the number of cast on stitches at the beginning of each row. 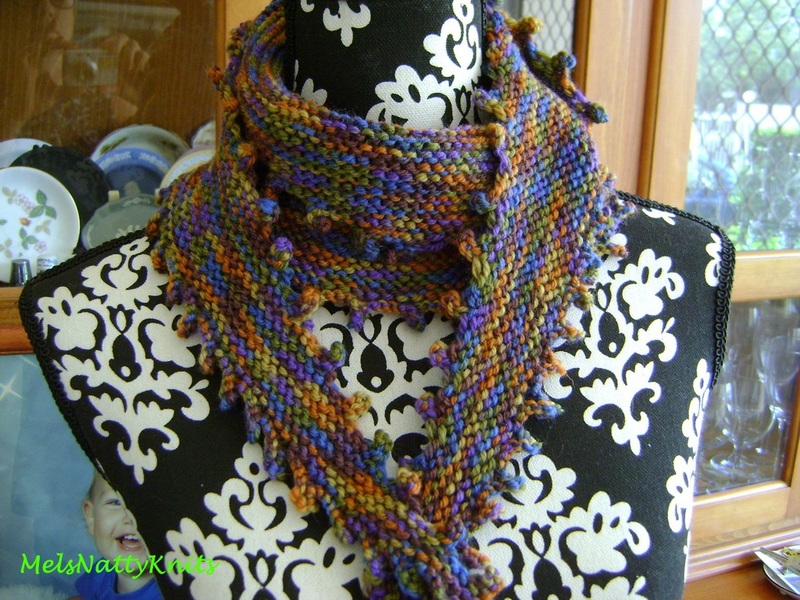 I tend to cast on seven stitches which makes the scarf grow wider faster. 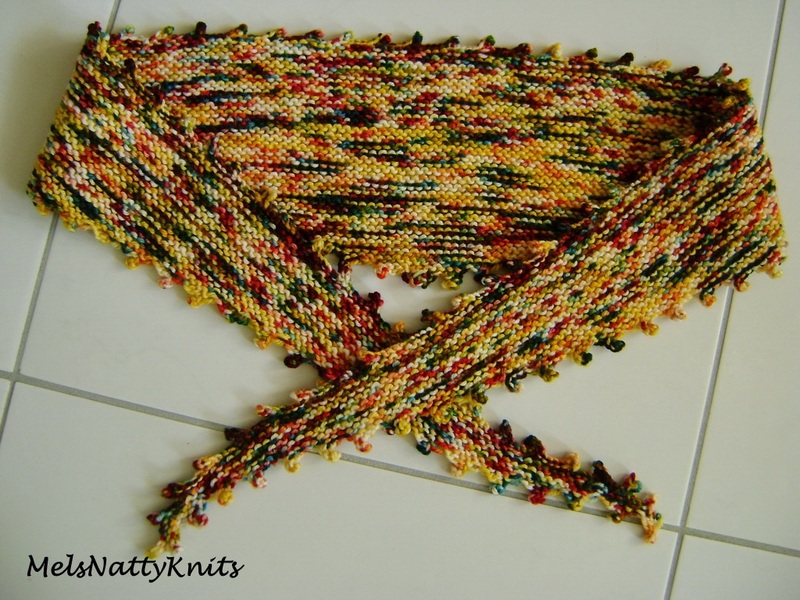 By casting on five stitches at the beginning of each row your scarf would grow wider a bit slower but you’d get more of a triangle effect in the front. 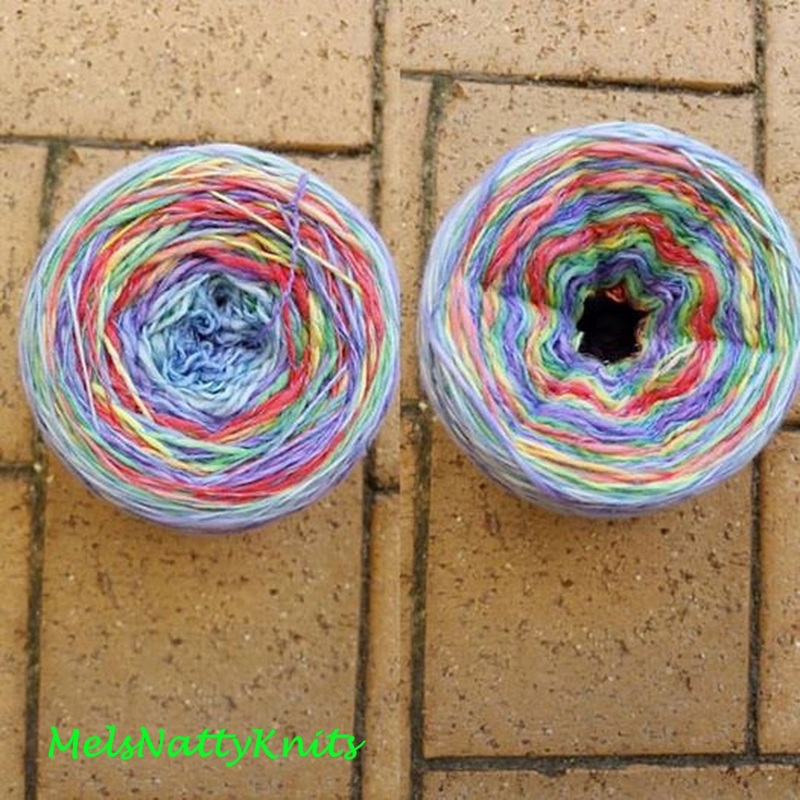 It’s all dependent on how much yarn you have to start with. 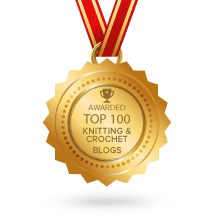 The biggest challenge is making sure you leave enough yarn for your picot bind off! Before I sign off, look what I found at the Noosaville newsagent.